This is a card I will send to the troops as part of Operation Write Home, inspired by the “Going Dotty” challenge. 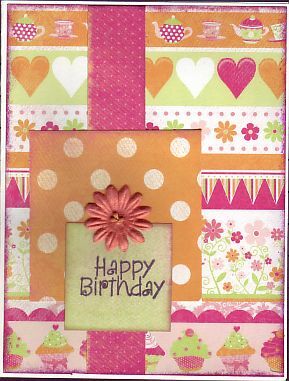 This entry was posted on Wednesday, March 9th, 2011 at 10:14 pm	and tagged with cardmaking, stamping and posted in Challenges, OWH. You can follow any responses to this entry through the RSS 2.0 feed. Yvonne! I posted a card right after you did! I was shocked to see your name. Glad you found the time to post with your busy schedule. Oh yeah, I like your card too. lol On Friday I will be the featured Friday cardmaker on this blog. They did a little online interview with me. I have no idea what cards they will post. Come have a peek at it. What a great dotty card, I like the hearts too 🙂 Thanks for playing in our challenge at Operation Write Home this week! Such a pretty card Yvonne. So nice that you’re making cards for such a wonderful organization. What a yummy color combination the oranges and pinks make together. I have no doubt this will be snatched right up by some hero with a daughter at home. Nice!